1. You’d never realize it walking through the upper town today, but Zagreb was once two towns, Kaptol and Gradec. Back then the two were at odds with each other so there was a strip of dangerous “no man’s land” between them, but it is now filled in with buildings and streets that connect them so seamlessly, you’d never know they were once separate! 2. 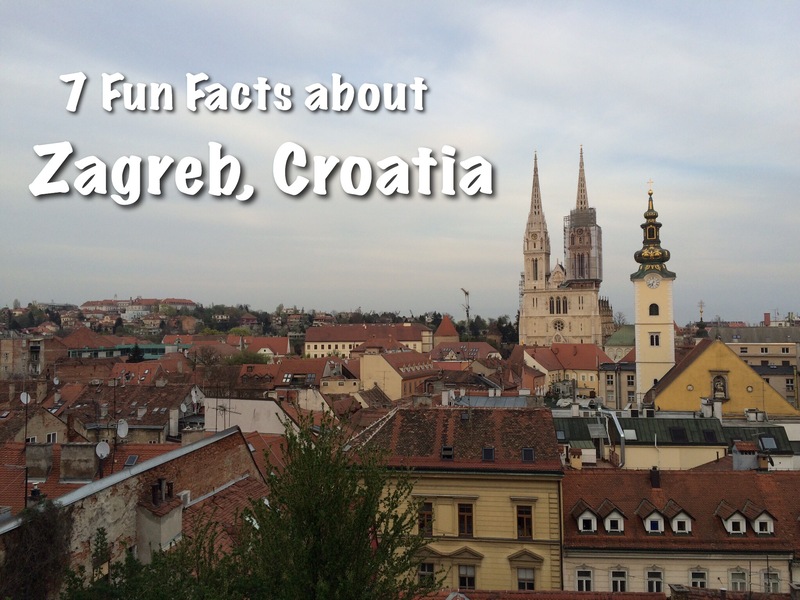 The Zagreb Cathedral is the tallest building in Croatia. At first I was bummed to see that they were doing restoration work on one of the spires (obviously thinking that wouldn’t look as nice in my pictures! ), but on our walking tour, our guide told us that there has been reconstruction going on for more than 20 years due to the quality of the limestone it was originally built with. After that I began to notice that even in a lot of postcards, you could see the scaffolding on the spires! 3. Another fun fact about the cathedral: there are 3 large chandeliers on the ceiling that were initially hanging in a casino in Las Vegas! 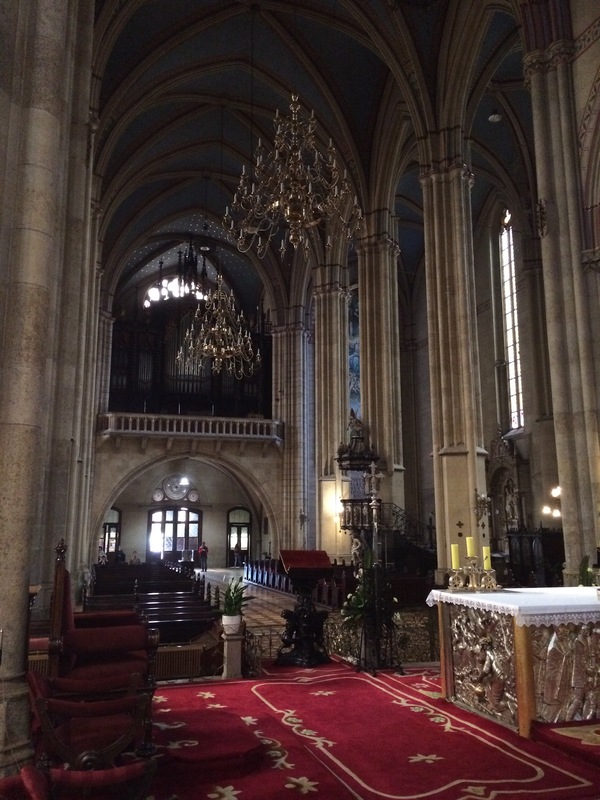 The story according to our walking tour guide is that when they were first brought to Zagreb, the church wasn’t sure if they really thought they were right for the cathedral (both aesthetically and morally) but hung them up to see how they’d look and then just never took them back down. 4. The upper town has over 200 lampposts, none of which are electric – they are all individually lit every evening and extinguished every morning! For years and years, one man who’s now in his 70s has walked around to light and snuff them himself every day and he now has an apprentice to help and learn from him. 5. Along what was once the south wall of Gradec there is a tower called Lotrscak tower. For over 100 years the cannon at the top has been fired every day at noon – our walking tour was timed so that we’d pass by just at that time! 6. I had read that Zagreb was a city of street art, but I did not expect any in the middle of the upper town… Amongst buildings that are hundreds of year old right next to the church of St. Catherine, there’s a building with a huge mural of a whale! 7. And the last one is more of a tip than a fun fact… Right by the Jelacic square in the center of town, there’s a scale model of the Zagreb – it was very helpful as we were getting our bearings of the city! And that’s it for Zagreb! After Zagreb, we headed to the coast of Croatia to the city of Split, details coming soon! This entry was posted in Croatia, Europe, Eurotrip 2016-Croatia, Vienna, Budapest and Venice, Zagreb and tagged Croatia, Europe, Fun Facts, Schmahl World, travel, travel tips, Zagreb. Bookmark the permalink.